244 pages | 11 B/W Illus. 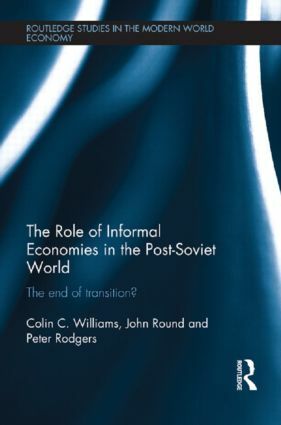 Based on extensive ethnographic and quantitative research, conducted in Ukraine and Russia between 2004 and 2012, this book’s central argument is that for many people the informal economy, such as cash in hand work, subsistence production and the use of social networks, is of great importance to everyday life. Formal work is both a facilitator of such processes and is often supported by them, as people can only afford to undertake low paid formal work as a result of their informal incomes. By looking at the informal nature of formal work and practices, informal practices, gift giving, volunteer work and the economies of the household the book is one of the first to give an overview of the nature of the informal economy in all spheres of everyday practice. Colin C. Williams is Professor of Public Policy at the Management School at Sheffield University, UK. John Round is Senior Lecturer in Human Geography, School of Geography, Earth and Environmental Sciences, University of Birmingham. Peter Rodgers is Lecturer in Strategy and International Business, Management School, University of Sheffield, UK. In an increasingly interdependent world, many of the most important issues are driven by economic forces. This series applies newly developed economic techniques to some of the most pressing contemporary problems. The aim of the series is to demonstrate the relevance of modern economic theory to the modern world economy, and to provide key reading for researchers and policy-makers.